It's becoming the same old story for the Bulls as they travel for Monday's 6 p.m. game against the Charlotte Hornets. Can everyone follow the lead of Kris Dunn and make shots? Huh? "Kris has been phenomenal," said Bulls coach Fred Hoiberg. "He's been very vocal and played with a lot of confidence. That's where it starts with Kris. To see the growth in Kris Dunn from where he was a year ago when we got him to where he is now, it's fun to see the progress he's made." The Bulls hope to also make some progress and a better effort than they did in Milwaukee last Wednesday—it would be difficult not to—while regaining some confidence after falling to 1-1. They'll close the preseason with United Center games Wednesday and Friday. "Their physicality took us out of anything that we wanted to accomplish," Hoiberg said about the 34-point loss to the Bucks. "We had the wrong guys taking the ball out of bounds. We had no rhythm on the offensive end. Defense was awful all night. Lot to learn from." So a team looks for positives. 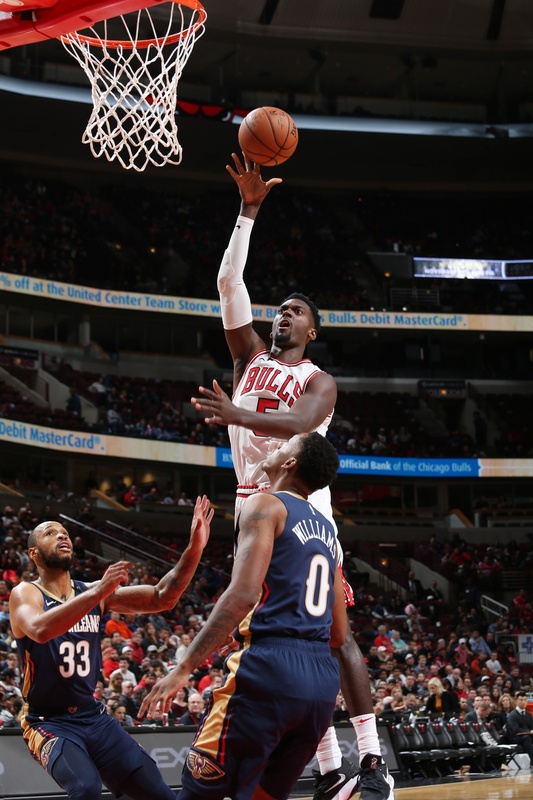 Bobby Portis has been one, leading the team off the bench averaging 19 points in 23 minutes. Antonio Blakeney, also off the bench, is tied for second in scoring with Zach LaVine. Rookie Wendell Carter Jr. fifth. So three of the team's double figure scorers are playing on the second unit with Lauri Markkanen and Denzel Valentine out with injuries. LaVine, who left the Bucks game with a bruised thigh and didn't practice Thursday, was back at practice and scheduled to start with likely the same group in Charlotte. LaVine has shown his exceptional athletic play, but perhaps the most consistent starter has been Dunn. Especially, and unexpectedly, with his shooting. Dunn's shooting was considered his greatest weakness in two seasons out of Providence College. Mostly off the bench until early last season, he's shot 41 percent overall, 31 percent open threes and 69 percent on free throws. It was the unappealing 30-40-70 shooting trio. Dunn hasn't shot much in the two games, mostly driving to the basket. But the 24-year-old 6-4 guard has been finishing for scores better than last season and showing a more decisive shooting stroke. Dunn is eight of 13 overall in the two games for a team best 61.5 percent. In the team's awful 11 for 59 three-point shooting, both Dunn and Carter are one of two on three pointers. The rest of the regulars are 20 percent and below. It is a small sample with just two games. And the Bulls are achieving some goals with a pace producing 100 field goals per game and averaging about 30 threes per game. The problem for now is making them more than taking them. Markkanen and Valentine being out diminishes the accuracy because they are two of the team's most accurate three-point shooters. But the starters, particularly, have been relying more on mid range shots without enough ball and player movement. With poor defense, the Bulls haven't been able to get in transition much and have a combined 14 fast break points in the two games. Dunn is also leading the team in rebounding and hasn't missed a free throw, a perfect five for five. His play was to come under considerable scrutiny this preseason because of the uncertainty about whether he could be a reliable two-way point guard. Thus far he's been passing inspection. Perhaps he needs to be even more aggressive offensively given the team's poor marksmanship, 38 percent overall shooting. It's just one of many challenges facing this Bulls team in a difficult start without Markkanen, considered perhaps the team's potentially best all around talent. It's resulted in a late training camp move of Jabari Parker to power forward and Justin Holiday back into the starting lineup. So it's been a halting start, a quick zero to 60 in the opening acceleration against the Pelicans. And then a stall in Milwaukee with the Bucks playing their first preseason game in their new arena. Now the Bulls are in Charlotte in the abbreviated preseason with just five games instead of the usual eight in previous seasons. The Hornets have a new coach in former Spurs assistant James Borrega and new general manager in former Lakers executive Mitch Kupchak. The Hornets have won two of three and have been led in scoring by Michigan State rookie Miles Bridges. He is making more than 50 percent of his threes in this impressive rookie class. 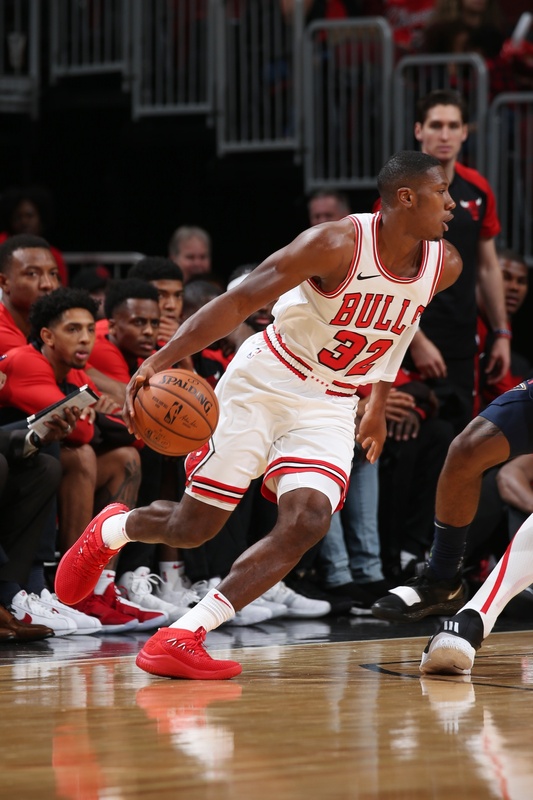 The Bulls' Carter has been quietly effective, averaging 10 points on 56 percent shooting and six rebounds in about 24 minutes off the bench. For the Bulls Monday, however, the goal will be to erase the stain of the poor performance in Milwaukee that included Parker shooting one of 12. He is six for 26 in the two games. "I don't know that we had the rhythm, really, on the floor," acknowledged Robin Lopez. "That's something as we play together we're going to start gelling in that area a little more. I think we're all aware that we didn't do a great job of moving the ball around on offense, using the shot clock, getting those optimum shots. Once we find that rhythm, we'll start hitting those shots. But we've also got to make a conscious effort to get those opportunities for ourselves. We didn't have the effort; we didn't have the edge necessary. I really think it comes down to our mindsets. It's got to be everybody on the floor challenging each other during the game, pushing each other to have that edge, to have each other's backs. I know it sounds obvious and stupid and idiotic. But we've got to make sure the other team isn't just comfortable out there getting to the shots they want." The laboratory experiments continue. The opening game is in 10 days.